Northern half of asteroid Vesta between Mars and Jupiter is more heavily cratered than the south and no one knows why. 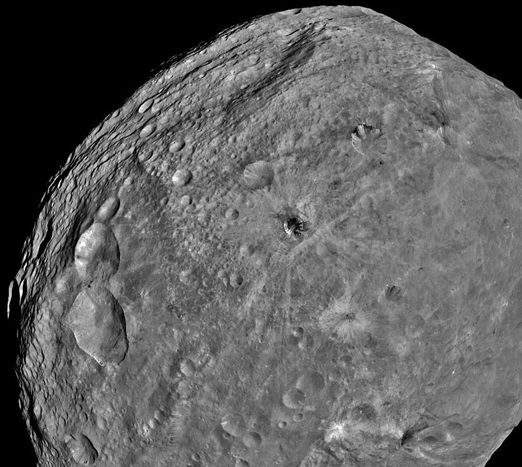 Image above of the 310-diameter Vesta (500 km) was taken by NASA's Dawn spacecraft on July 24, 2011, after entering into orbit around Vesta on July 15, 2011. Dawn is the first Earth robotic spacecraft to orbit Vesta, the second largest object in the asteroid belt. Also unknown is what makes the dark streaks in some of Vesta's craters such as the crater near image center? Or what makes the grooves that circle the asteroid nears its equator? 2011 image by NASA and JPL-Caltech. 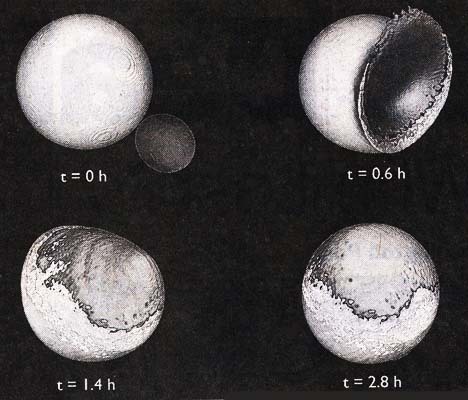 Illustration of four stages in collision between Earth's present Moon and a companion moon about 4 billion years ago. The smaller moon crashed in a “big splat” against the bigger moon, according to theory by Martin Jutzi and Erik Asphaug, University of California - Santa Cruz, in August 4, 2011 issue of the journal Nature. August 4, 2011 Sunshine Coast of Australia - This week there has been science news about a theory that once upon a time Earth had two moons and the smaller one crashed into the larger one in a “big splat.” Also, the NASA Dawn spacecraft's first orbit of rocky Vesta in the asteroid belt between Mars and Jupiter begins August 11, 2011, at an altitude of nearly 1,700 miles (2,700 kilometers) to provide in-depth analysis of the mysterious asteroid. Dawn launched in September 2007. Following a year at Vesta, the spacecraft will depart in July 2012 for Ceres, where it will arrive in 2015. Next PostNext Small Dragonfly Drone Near Ft. Benning, Georgia?